The whole point of installing a water feature was to reduce stress, not add to it. There is so much conflicting data of do’s and don’ts that your head is probably spinning. 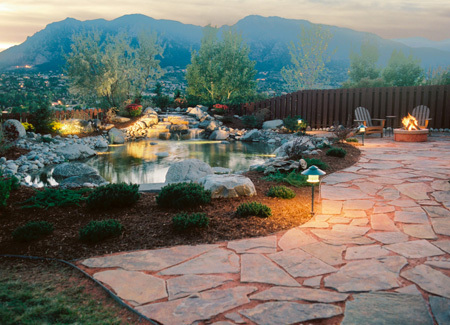 The main point to remember is that the trick to a great looking pond is balance. Let’s figure out a low maintenance way to keep your pond beautiful. With these elements present, with the exception of some seasonal maintenance, all you need to do is add beneficial bacteria and clean out the skimmer net every other week. In our altitude in Colorado Springs you may also need to add a product to help keep the string algae under control. Mechanical filters or skimmers act like a pool skimmer and filters out large items such as leaves and twigs from the pond. You should clean this out as needed. Usually once or twice during the summer and more often in the fall when vegetation looses leaves. If you have a large wind storm, check the skimmer to see if there is additional debris that needs to be removed. A Biological filter is the filter that catch and grow the beneficial bacteria colonies so that when water passes thru these colonies, the bacteria cleans the water. Do not clean these filters more than once a year or you will kill off the bacteria colonies. It is a must to have the proper pump for your feature. It is good to have a pump that circulates your water through the filters one time each hour. Rocks and gravel protect the liner so that it will last longer in the sun. They also provide additional surface area for bacterial colonies to grow on. Plants and fish keep the ecosystem balanced with their roots and waste. Five elements are the key to balancing and keeping your pond working smoothly. Spring is an exciting time of the year. Everything is coming back to life and is fresh and new. Early Spring is the best time to clean out your pond – when the water temperature is about 55 degrees and your plants are just starting to sprout. Place clean out pump in the deepest part of the pond and begin pumping out the water. Place some pumped water in a container with a lid and when pond is just a small pool, use a net and put the fish into the container and put in shady area. Pressure wash the debris off the rocks in the stream and in the pond. Use a garden hose to rinse the stream and pond from top to bottom and pump out the dirty water. Keep rinsing and pumping until water is clean. Clean out biological and mechanical filters and replace. Re-attach main pump if necessary. Begin refilling your pond making sure you use dechlorinator to make the water safe to reintroduce your fish. Slowly acclimate your fish to the pond water and re-introduce your fish the pond. For your pond Fall and Winter depend on the water temperature not the date. You need to watch the temperature and start taking action around 55 degrees. Your pond should look great with the cooler temperatures and full lush plants. There are a few things that need to be done. Notice that the following is mainly for the Colorado Springs, Monument, and Castle Rock climates. Cut down yellow leaves and dead buds from plants. Empty skimmer debris net more often to get rid of extra organic matter. Excess organic material will color your water a tan color. Adding activated carbon will help clear the color. Stop feeding your fish when the pond water is between 50 and 55 degrees. Their digestive system slows down and is unable to break down the food. Add a bubbler pump to a shelf area to keep a hole open in the ice. You need the hole open so that the excess fish gas can exchange with oxygen to keep the fish alive. To turn off pump for winter, unplug the pump and detach from the main plumbing and remove from the skimmer. Keep in a bucket of water where it won’t freeze to keep the seals from drying out and breaking. If you keep the pond running, check the stream often for ice dams that would divert the water outside the stream. As the colder water becomes ice, your water level may drop. At this point you will need to add extra water to keep the level up.